Happy Wednesday! Sure hope your week has been going good, I'm glad you stopped in today! I'm on a Sketch Challenge roll this week - today's card was inspired by CPS Sketch #137 , a super simple sketch that I can see using again and again! For my focal image I used a leftover piece of Spectrum Roll I had laying around that had been done with Pumpkin Patch Ink. 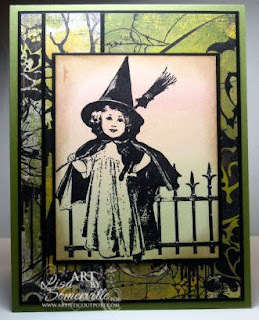 I stamped and masked the images from the Artistic Outpost Vintage Halloween in Black Archival, then sponged the edges with Stampin' Up! 's Soft Suede, layering the panel on a beautiful piece of Basic Grey Eerie paper. Gotta love those ten minute and under cards! Don't forget about the Artistic Outpost Sketch Challenge - you have until October 23rd to enter for your chance to win a $25 gift certificate - click here for more details! Fab card, the image and the colours . Love the card and the colors of it!